If there's one area of the game that separates good golfers from middle and high handicappers, it's the ability to play long-iron shots. I won't kid you that these are the easiest clubs in the bag. On the other hand, they aren't as difficult to master as most people think. The best advice I can give you is one of philosophy: Don't try too hard. Amateurs watch the pros hit long, high, arcing 2-lrons and then they go out and try to make their own 2-irons do the same thing. But the key is not to make it happen but to let it happen. Don't try to hit the ball hard or high. In fact, don't try to hit the ball at all - just make a smooth swing at it. Pretend the club in your hand is a 7-iron and the distance you have is 7-iron distance. 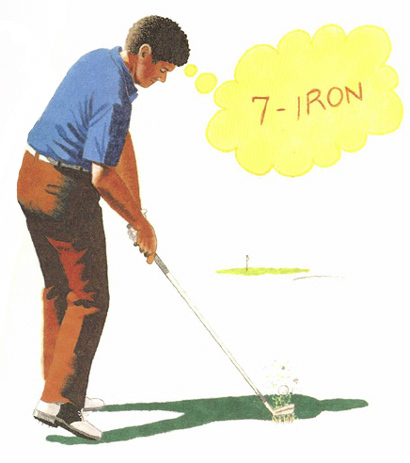 Then swing that '7-iron' in the same confident way you always do. Think of the ball as merely a point on the path of your swing.